The asthma hospitalization rate in Chicago remains significantly higher than the national average. While the origins of the disease remain elusive, mounting evidence has made its risk factors more clear, and Chicago has somewhat of a perfect storm for asthma problems. Part of the city’s above-average rate is demographic. Minorities have a higher prevalence of asthma. Puerto Ricans, even when sharing the same environmental conditions as other ethnic groups, suffer higher asthma rates. African-Americans, too, are significantly more likely to have asthma than non-Hispanic Whites, according to the U.S. Department of Health and Human Services. And while the demographic trend is toward higher risk for asthma in cities like Chicago, the “triggers” that set off asthma attacks are also clustered in and around the nation’s major metros. “Having the disease is one thing. Having it under control is another,” said Brian Urbaszewski, director of environmental health programs for Respiratory Health Association. Based in the West Loop, the nonprofit RHA has worked to fight lung disease since 1906. They promote asthma awareness and education, and have joined with environmental groups to advocate pollution controls for area coal plants. Public health studies tied Chicago’s shuttered Fisk and Crawford coal plants to 2,800 asthma attacks annually. Asthma is a chronic disease, meaning there is no cure. But poverty makes it difficult to manage a recurring condition like asthma, which could require a lifetime of treatment. “Nobody should wind up in the hospital for asthma,” Urbaszewski said. Yet each year there are thousands of asthma hospitalizations in Chicago alone. Death rates from asthma are particularly high for African Americans and Hispanics, and are concentrated in urban areas, including Chicago. 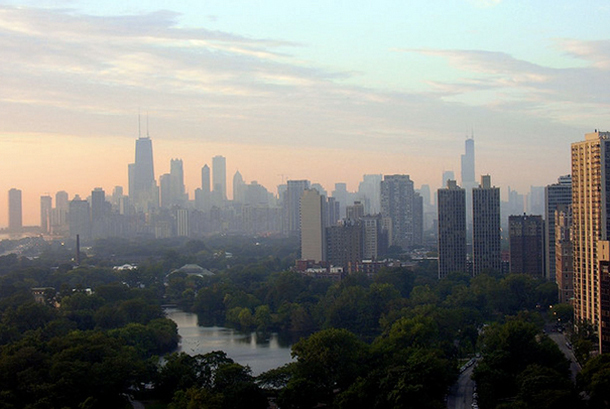 Air quality in the Chicago area has improved since 2000, following a national trend, but The American Lung Association again flunked Chicago in its annual “State of the Air” report released in April. Local agencies have taken steps to improve air quality awareness, including a new system of colored flags for Chicago schools. But air pollution from vehicle exhaust remains a major factor for poor air quality. Urbaszewski recently traveled to Washington to push for new smog standards proposed by the Environmental Protection Agency. The EPA is accepting public comments on their Tier 3 Vehicle Emission and Fuel Standards program through July 1. New research suggests some air pollution might directly cause asthma, as opposed to it just triggering an attack, but the principal cause of the disease remains unclear. A recent study in the European Respiratory Journal, the first ever to estimate the how many asthma cases could be linked to road traffic pollution specifically, found car exhaust on par with second-hand smoke. The study said 14 percent of chronic asthma in kids is caused by car exhaust, comparable to the 4 to 18 percent bracket of childhood asthma cases resulting from exposure to second-hand smoke, according to World Health Organization estimates. There are more diesel cars in Europe, however, whose fine particle soot could exacerbate the effect compared to the U.S. auto fleet. Whether or not it causes asthma, car exhaust — a major contributor of smog, or ground-level ozone — is a potent trigger for asthma attacks. The proposed EPA standards, which wouldn’t take effect until 2017, would require auto manufacturers to build heartier catalytic converters — the car part that chews up noxious chemicals before they exit the tailpipe — and oil producers to clean sulfur impurities from gasoline. Oil and gas companies have spoken out against new regulations, which they call an undue burden on the recovering economy. The steps would raise the cost of gas slightly, but proponents of the higher standard say the cost would be about one cent per gallon. California already has its own tailpipe standards. While 12 states have adopted California’s higher bar, Illinois is among the majority who follow the national standard that currently allows for more smog. Chris Bentley writes about the environment. Follow him on @Cementley.